Whispers in the Loggia: Pope To (Myanmar's) Church: "The Way of Revenge Is Not of Jesus"
Pope To (Myanmar's) Church: "The Way of Revenge Is Not of Jesus"
Thanks principally to the 104 overseas tours undertaken by John Paul II, there aren't many places left on earth where a Pope could say Mass for the first time – China and Russia are the big ones, Vietnam isn't far behind, and most of the Middle East is in there, too.... But now, one of the few others remaining can be struck from the list. 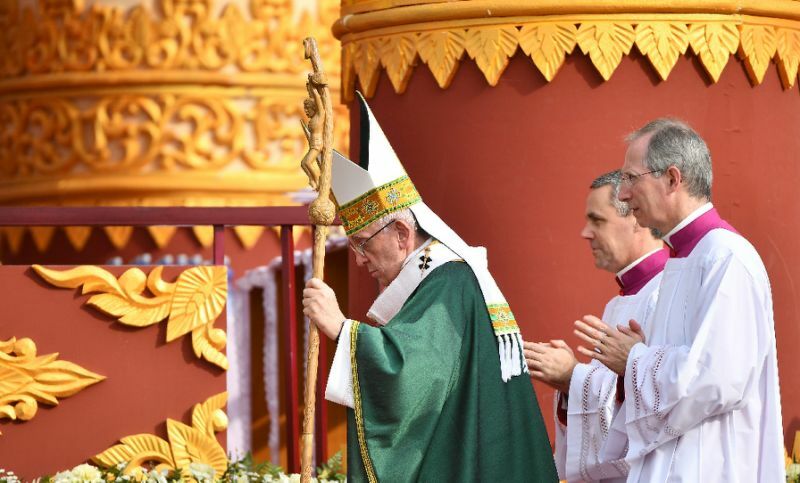 Early this morning, Francis celebrated Myanmar's first-ever papal liturgy on a Yangon racetrack, drawing roughly a quarter of the country's 700,000 Catholics. Trading in his usual silver pastorale (staff) for a wooden one more in keeping with the Asian context (above), the Mass on a stage resembling a pagoda – the first of this weeklong visit's mostly-in-English liturgies – saw Papa Bergoglio shift focus from the diplomatic fracas that framed the trek's wider storyline to a meditation on how the Cross should inform the life, challenges and gifts of a church living as a distinct minority (often coupled with dire poverty), and the contribution such a community can make to society at large.